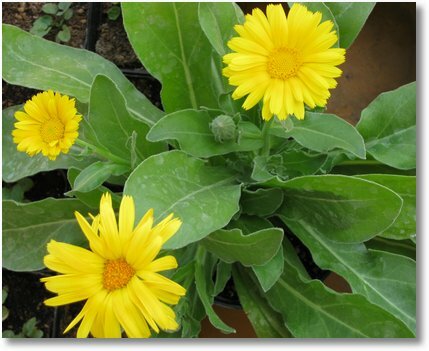 I had few calendula seeds stashed since quite some time and I had tried seed starting them only to face failure. The seed packet costed me Rs 5. So I couldn’t complain. One day I just threw the bunch of left over seeds into a pot and watered them. It took very long and just when I thought I will toss the pot over, I see one cute little seedling peeping out.. I also had few other seeds that I sowed in and hence I didnt know what it was until the true leaves came out.. After that lot of progress, I watered; It grew and here they are happily posing to you all.. When I took my camera out to take the pic below, it was like 3 kids competing with each other for a photograph..
Ah! 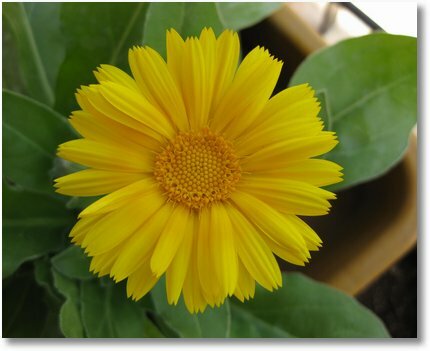 This reminds me of my Pot Marigold (a different hybrid) that died months ago :(. She germinated really fast – within 2 days! May be the quality of seeds matters guess, but no matter how long it took, your blooms are gorgeous. May be I should try the Pot Marigold again later this year as the packet indicates it’s mix of colors, I might get the same color as yours! That bloom looks so gorgeous. What’s great about these is that their leaves smell great – kinda tangy and they’re not very fussy at all! Some plants just love to get their faces into a shot. The closeup shows how lovely the bloom is, with the overlapping petals. It looks like you have more buds still to delight you. The Calendula blooms are lovely! I am also waiting for my calendulas to reward me with such beauties, but going by the weather in north India, I think I’ll have to wait as nothing blooms in such temperatures. Till then I’ll find pleasure looking at your gorgeous blooms.